Claremont, Calif. (June 29, 2015)—Pitzer College alumna Alyssa Woodward ’15 was named the Association of Collegiate Water Polo Coaches Division III Women’s Water Polo Player of the Year. This is the latest in a slew of end-of-the-year and end-of-her-college-career honors for Woodward, who graduated in May with a degree in studio art. 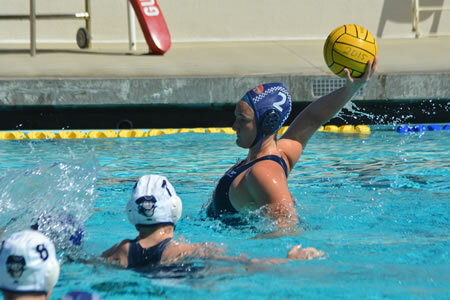 A total of five Sagehens were honored by the ACWPC. Fellow senior Sarah Westcott (PO ’15) joined Woodward in earning first-team All-America honors after standout careers crowned by four straight SCIAC titles, including a co-championship this spring. Pitzer rising junior and goalie Ahsha Earwood ’17 was named to the second team, while Morgan McCracken (PO ’18) and Mahalia Prater-Fahey (PO ’15) earned honorable mention honors. In addition to her Division III Player of the Year Award, Woodward has been named the SCIAC Athlete of the Year after leading the Sagehens in scoring for the fourth year in a row (65 goals) and helping the team to an undefeated regular season (8-0) in conference play. She was a first-team All-America selection for the fourth straight season. Woodward crossed the 300-goal plateau late in the season and finished with 318 goals. Earwood earned All-America honors for the first time in her young career after a strong sophomore campaign which saw her tally 160 saves in 22 matches. She was named the SCIAC Athlete of the Week after helping the Sagehens to a 4-0 record at their host Convergence Tournament, including two overtime wins when she did not allow a goal. The Sagehens finished the 2015 campaign with a 19-10 overall record and a 10-1 mark in the SCIAC. Earwood and McCracken will lead a younger squad in 2016, after the graduation of seven seniors from the Class of 2015.